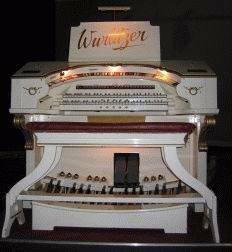 The Peterborough Wurlitzer, a model 165 special, was shipped to the UK on 26th July 1928. The organ, opus number 1915, was first installed in the Regent Cinema in Dudley, West Midlands and was often played by Harry Farmer in his early cinema days. The Wurlitzer was installed in the Regional College in 1981, since when regular concerts have been presented to the public. In later years the organ’s specification was expanded to 11 ranks of pipes, although this has subsequently been reduced to 8 ranks; the additional stops being a pair of strings built by Conacher of Huddersfield. In the late 2000s the College was slated for rebuilding and redevelopment, and the Wurlitzer’s future was uncertain. However, these plans were put on hold and a new organ committee, headed by Paul Turner, was formed to ensure that concert presentations remain a regular feature of the College.